Today’s poem is a limerick with the topic of “journey”. I began working on this late last night after a long and busy day, so needless to say the only thing I could think about when creating a poem about “journeys” was how much I wanted to rest! (This is why I should’ve waited to write the poem after I got some sleep, ha!) Anyways, my betta fish Betty is the star of today’s poem, and this limerick is an ode to her simple and fun journey through life. Eating fish flakes, blowing bubbles in song. In her life, what could possibly go wrong? Silly, I know! That’s what I get for writing when I’m tired (ha!) Tune in tomorrow for another poem! This entry was posted on February 17, 2015 and tagged betta fish, betty the betta, limerick, poem, poetry, Writing, writing201. Fish Louie posing for the camera. These two fish were tank neighbors but at first meeting did not get along. Nina, who was older, was fond of the former fish who lived in Louie’s tank, Captain Kirk. She did not like Kirk’s replacement and was not afraid to tell Louie her thoughts on the matter. She would snub him, flare her fins at him, and pretty much glare him down at any chance she could get. Louie, however, was fond of Nina. He would often gaze at her from a distance, swimming off and hiding whenever he saw her look at him. When she wasn’t looking, he’d swim back out, playfully swimming back and forth as if wanting to say hello. After about a year of friendship, Nina got sick. She was an older fish and had already lasted longer than any of the other fish in the tanks. When she got sick, she swam over to her side of the tank where she could be near Fish Louie. Fish Louie swam over to his side of the tank so he could be close to her. During the days she was getting weaker, he never left her side. Then, on her last day, she swam into her little fish castle and swam half-way through the opening, facing Louie’s tank. When I got back from work that afternoon I found that little fish Nina had died. It made me sad to say the least, but at the same time I couldn’t help but feel touched as I looked at Louie’s side of the tank. He was pressed up against the edge, looking sad as he faced Nina in her little castle, as if waiting for her to get back up and play. This happened a few years ago, but the story of Fish Louie and Nina, how they first didn’t get along but then became very good friends, was a story that touched my heart. I never was one to think that story could come from animals in nature (let alone two pet betta fish), but after seeing the loyalty that Fish Louie had to Nina, how he never left her side as she was sick and dying, I suddenly realized that we (humanity) aren’t the only ones who have a story. Animals, like Louie and Nina, have a story. For those of you who have pets or have witnessed animals in action, I’m sure many you have seen others who have stories themselves. I think the beauty of story isn’t just in the words we read or the tales we hear, but also in what we see in the world around us. It’s easy to get busy with things like work and family, but sometimes, when we take a breath from our hectic lifestyle and simply watch the nature we’re surrounded by, we see the most amazing stories at work. Whether told by people, or two adorable betta fish, we can always be witness to the beauty of story in nature as long as we are willing to watch and listen. 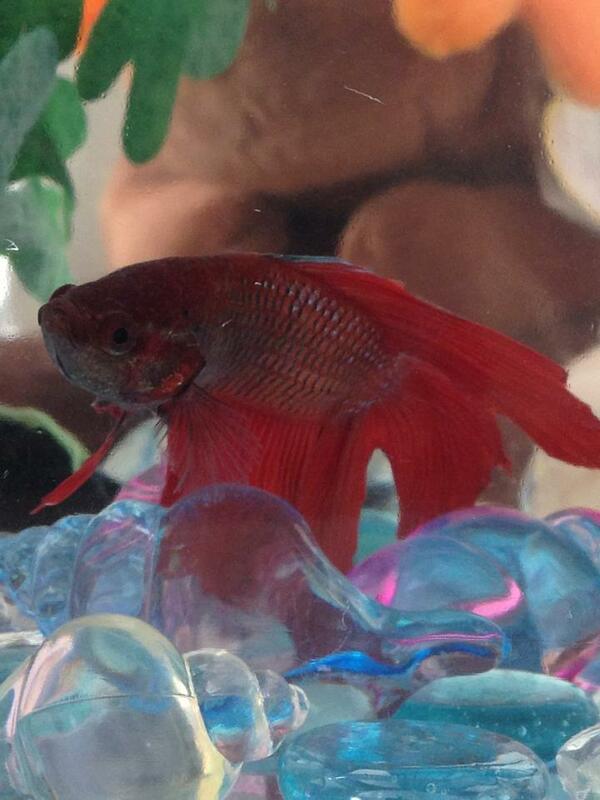 This entry was posted on March 6, 2014 and tagged betta fish, Blog, life according to Louie, life according to Nina, nature, story.